Extra-curricular activities – We have been told since time immemorial that it is essential to participate in activities that are separate from our day to day actions. Let’s take a second to figure out exactly why this is so important. Besides the overused terms such as personality development and forming of a well-rounded individual, we tend to ignore the main purpose of these activities that is to build and improve cognitive function. It is scientifically proven that beginning to work on these skills at an early age helps not only academically but also allows the mind to think differently and perform tasks with more efficiency. We at Mind Mentorz aim at achieving exactly this with our programs that include chess, Rubik’s cube, robotics and coding. We at Mind Mentorz believe that the quickest and most effective way to engage the mind of children is to teach them amongst others around their own ages who are also actively trying to learn the same piece of information. This not only boosts their confidence but also helps them be more perceptive while learning and removes any inhibitions that one might have. In simpler terms it is a more efficient way of carrying out group studies, except that this is much more fun! The environment created at Mind Mentorz aims at making the children comfortable and more importantly creates an environment that children want to be a part of. Our students from previous engagements have said to not only have enjoyed their experience with us but claimed to always look forward to their sessions. It is an excellent way to develop cognitive thinking without focussing on active school based learning. No two children are equally receptive to one method of teaching- one child may respond better to visualization whereas the other might find an auditory method to be more conducive. Keeping this in mind we offer multiple programs to pique the minds of the children. There is a program suitable for every mind as they each offer various methods of developing cognitive thinking functions by employing varying methods. 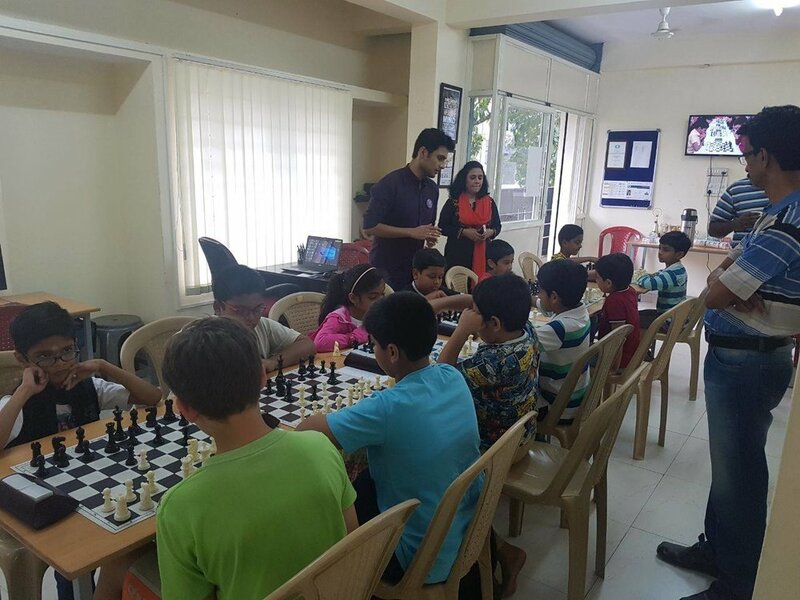 Chess perceived as a slower game surprisingly intrigues a large number of children with many of them taking a strong acumen to it. The skills learnt while mastering this game include patience; foresight and advanced thinking help the kids not only in school but also play a major role in the shaping of their personalities. The other programs offered such as Scratch coding, Rubik’s cube and Robotics also offer very exciting opportunities for children to master. The best part of their experience at Mind Mentorz will be the fact that they get to enjoy the company of their peers and get ahead of others all while having a blast! The coaching at Mind Mentorz offers the perfect after school activity that is not only enjoyable but also improves and develops cognitive skills that greatly aid in performance in school. With an enjoyable and interactive surrounding, it is the perfect way for students to invest their time in extracurricular activities that work and develop skills that are normally ignored in a school based environment. Developing cognitive thinking right from an early age has proved to be beneficial in acquiring better grades and many studies have proven that a direct correlation exists between higher cognitive function and ease of learning. It also aids in better control over emotional and mental stability and is a definitive bonus for dealing with the stress of teenage years. Emphasis on cognitive thinking also invariably leads to better relationships with parents owing to its emphasis on attention and comparative learning. There is no need to emphasise on the fact that in this day and age skills that allow you to cope with emotional and mental stress are more important than ever. Enrolment in this program will allow your kids to stay ahead of the game before it even begins! Older PostHow In-person Classes at Mind Mentorz Help Develop Your Kids' Cognitive Skills?